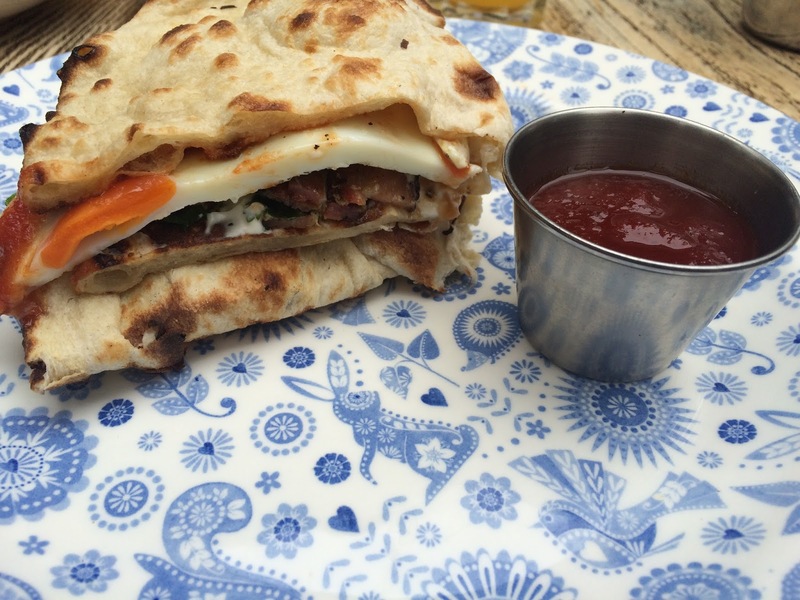 Now, now, NOW - EVERYBODY had told me about breakfast at Dishoom. Ages ago, like last year. Had I been, no? Why? I have no idea. Breakfast is possibly my all time favourite thing (other than gin and sausage dogs). I was staying in Shoreditch for four days for Best of Britannia so thought, why not meander down to Dishoom while I was in the area. Dishoom was thought up based on the old Irani cafes of Bombay many, if not all, have now closed. 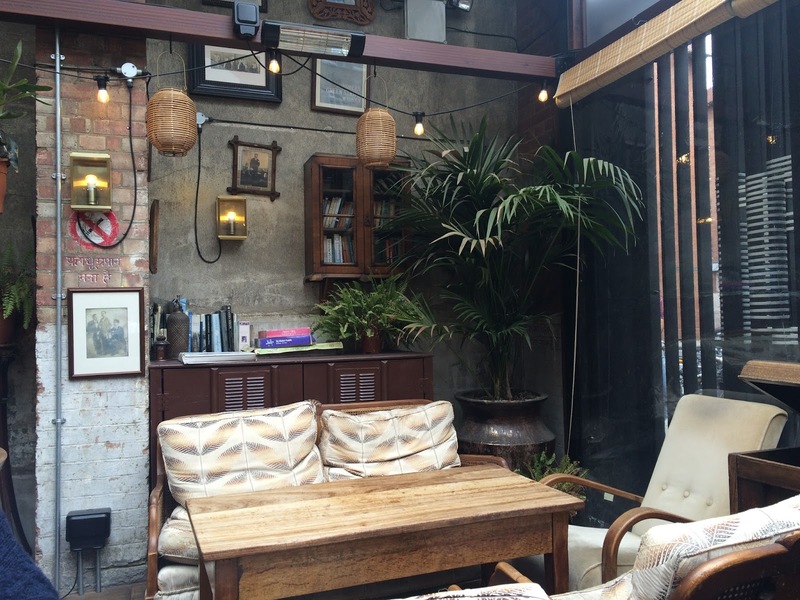 Why not have a Bombay-style café in London? Exactly. I've still not even been for an evening meal, only cocktails in the winter. A friend of a friend is manager for all Dishoom's and designs the cocktail menus, so I know the drinks are good. I have promised myself I'll go for an evening meal but 2 hour+ queues strike me with fear. Feeling ridiculously hungry, waiting in line, people going in before me...it's all a bit too much. I was incredibly excited by everything that was being served around me. Breakfasts with spicy beans, naans, beautiful teapots filled with fresh mint tea...allsorts. I opted for the classic Bacon and Egg naan, a fresh orange juice AND a pot of fresh mint tea. I like two drinks with my breakfast, it's become a habit. I love the atmosphere. So simplistic but FULL of character. I definitely think they have it almost spot on with décor, I'd quite like my house to look like the outdoor area of Dishoom in Shoreditch. My food came, I was mind blown. Something so incredibly simple was SO amazing. "The Ginger Pig’s smoked streaky bacon is dry-cured for five days with rock salt and Demerara sugar then cold-smoked over oak chips. 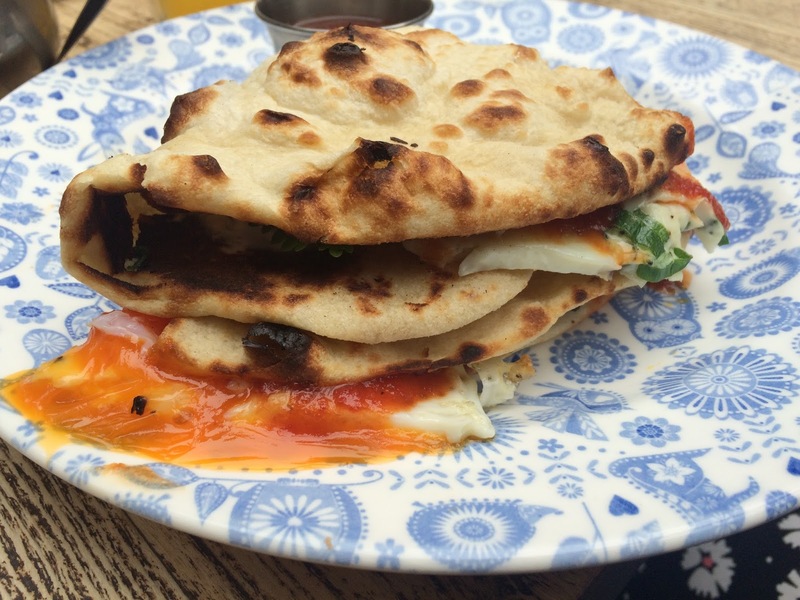 A Dishoom signature dish, and deserving of all its accolades"
STOP IT. Throw in a saffron-yellow, runny yolked egg and you've on the same page. The homemade tomato involved and addition of coriander really give it that all round authentic. Every single meal that was being plated up and delivered to the surrounding tables looked so well presented, full of colour and you could smell the authentic spices and flavours from the food. I've been dying to go to Dishooms for yeaaars. My cousin and I tried getting in for dinner a few times but, like you, we just couldn't face the queues.